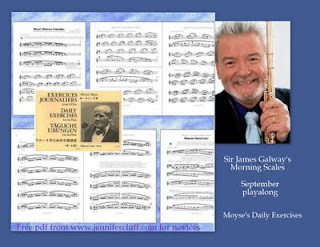 Here is the free pdf of part two of the Moyse Exercises Journaliers, re-written and simplified for those flutists of a novice or early intermediate level who are following the James Galway thirty-day scale class. I used the advanced-level Moyse book to create these more inspiring and approachable versions for flute students, and I've got at least four students of my own about to join in for the thirty day challenge. This has been a BLAST re-writing these. Download Part 2, of my exercises in pdf here. You'll find pages 10 to 21. You can hole-punch and put in a binder. Day 4 - ABCD etc. Day 11 - E etc. ...or some such plan as you devise. The idea would be that each time you return to an earlier lettered section, you can expand your range, and use the metronome to click ahead in tempo. Part three to follow will be these major and harmonic minor scales in thirds. I'll get to that this weekend. Hey, I'm totally having fun! Return to part 1 of this topic, and download first nine pages of the Moyse E.J. book simplified. Go to Part 3 for final section of E.J. book simplifed by Jen Cluff. These look fabulous Jen. Can't wait to try them out for myself and with my students! Your webiste is amazing and your teaching is inspiring. I am always taken by how you are still engaged in the learning process and by how gracious YOU are to your fellow colleagues, other flutists, and students. KEEP AT IT. You are amazing and you have helped inspire me so much in my teaching! Thank you. I just wanted to let you know what a wonderfully invigorating, fun workout I had this morning using your Moyse's EJ pages (Parts 1 and 2). Your simplified version has given me the strength, more knowledge about scales, and about Moyse's overall lesson plan ("the big picture") to want to start to tackle his text, which I find very dry, but probably just what I need. I am eagerly waiting for your next installment !!!! I just want to thank you for so freely sharing your knowledge. That's the kind of teacher I had always strived to be. Please continue to be you and don't stop doing what you do best. You guys are TERRIFIC for commenting. Thank YOU so very much everyone for all the kind little notes. You're empathy personified; I'm so grateful. You make my week AND my day! I have taught at universities in the midwest for over 25 years. I am always blown away by the sophistication and passion of your ideas in teaching. I cannot WAIT until you post another blog and you just make my day when you do! 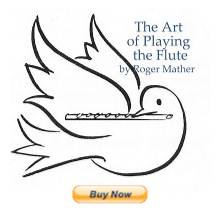 I constantly tell my students that if they have just one source to go to for flute information that they should go to your site. I do not know how you do it. You always have the best and the latest as well as the most interesting and thoughtful info. on flute performance, teaching, and musical inspiration. My college freshman always enter playing scales up to high D, but most, if not all, cannot complete scales in a fluent way without stumbling and breaking down. You must learn to walk before running, and giving students material that they can first learn to walk will put them in a much better position to advance more quickly and with more accuracy. I certainly don't need to tell you all of this . . . I just wanted to thank you for your incredible expertise and generous spirit and wanted to say again how much you are valued and respected. I greatly look forward to going to your site daily - even if you do not post something new I always find something new to excite and inspire me. What FUN!!!! Ha! p.s. I cannot tell you how much I have enjoyed Play with a Pro - I would have NEVER learned about this if it were not for you. I purchased the Pahud sessions and am in the process of playing them for my students in a class setting. They cannot stop talking about them. My students absorbed so much in just one viewing and they keep referring to points made and bring those points up in a lesson. What FUN to see such progress and excitement in the learning process. You have to register to see the first video. There's an introduction so far, with more videos to hopefully follow. The 20 minute film takes awhile to load, so go make your lunch and return to play it after it's fully loaded.